There exists at least three main challenges that stand between the utilization of microrobotic systems in magnetic-based targeted drug delivery. First, realization of wireless magnetic-based control using feedback provided by a clinical imaging modality. Second, the ability to steer microrobots over relatively large distances using magnetic field gradients, or moving using self-propulsion. Third, the ability of magnetic systems and their controllers to compensate for the time-varying flow rates and other enviornmental uncertainties. 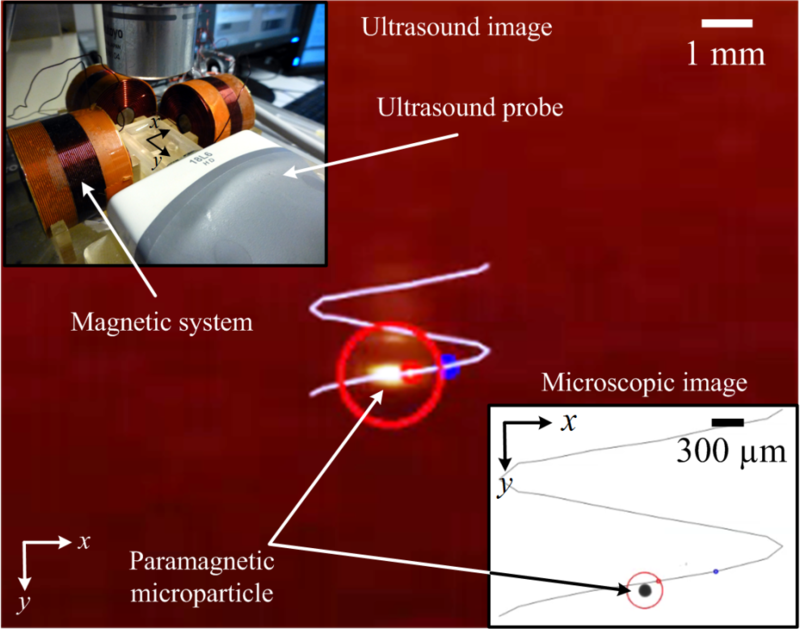 This project aims to use ultrasound images to track and control a range of microrobotic agents (e.g., paramagnetic particles, magnetotactic bacteria, self-propelled microjets, and biologically-inspired agents like Magnetosperm). Ultrasound has no unfavorable effects on health and high frame rates that allow for the realization of real-time control, and low cost, as opposed to magnetic resonance imaging and computed tomography. Alternatively, ultrasound or acoustic waves can also be used to propel microrobots. Thus, by establishing pressure disturbances to generate an artificial flow in the medium has been a latest development in transporting these microrobots. This phenomenon is attributed to the sound-fluid interaction in the workspace causing an induced flow that can carry entities like microrobots or drug loaded agents. Hence, this way multiplexing between sound frequencies enables a directional flow controlled transport of micro-robots. Our vision combines these approaches among others to advance the field of microrobotics by finessing the control of micro-robots and drug-carrying biological and hybrid micro-agents.